Only 18 Days Until Mother's Day! 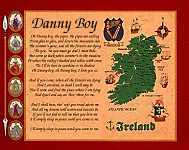 Get Free Shipping on the CD containing this and other great Irish Songs. Click HERE for more! Makes a great Irish Gift! All for sake of Mairi. That's the toast for Mairi. Show off these Lyrics in your Home or Office! or by telephone or postal mail as shown above. Drop us a line - we will reply!